I just want to add here that coding skills are equally, if not even more, important in remote sensing also. If you are a student of remote sensing, or an early-career professional in the field, it is essential to learn some coding skills (MATLAB, IDL, Python, Linux shells, etc.) for long-term career benefits, and to become a solution-builder rather than a solution-hunter. 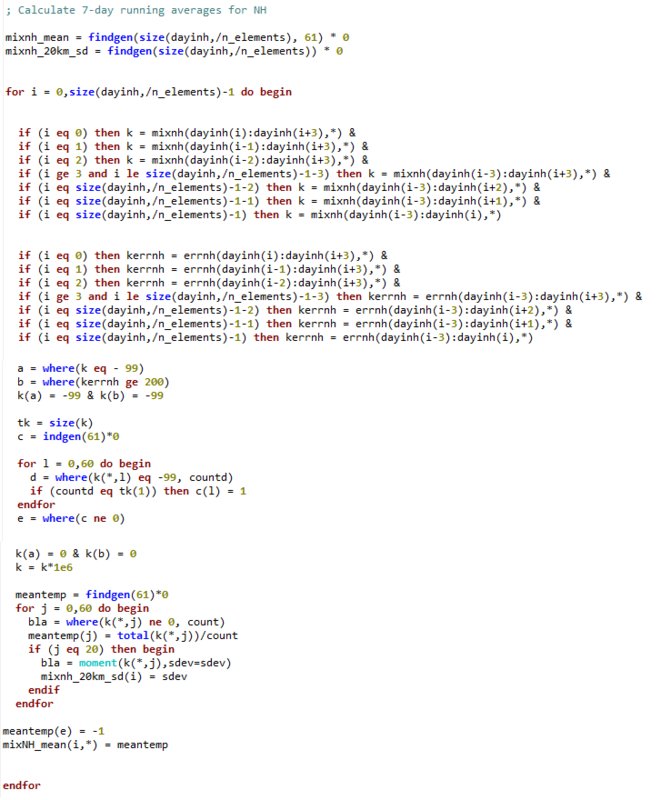 Snapshot of an IDL code to calculate a 7-day running mean of remotely sensed ozone profiles from POAM (Polar Ozone and Aerosol Measurement) III satellite. Code written by W. Qazi. This entry was posted in Uncategorized and tagged coding, GIS, remote sensing on January 17, 2015 by WQ. The history of the optical high resolution satellite images starts from classified military satellite systems of the United States of America that captured earth’s surface from 1960 to 1972. All these images were declassified by Executive Order 12951 in 1995 and made publically available (Now freely available through the USGS EarthExplorer data platform under the category of declassified data). From 1999 onward, commercial multispectral and panchromatic datasets have been available for public. Launch of Keyhole Earthviewer in 2001, later renamed as Google Earth in 2005, opened a new avenue for the layman to visualize earth features through optical high resolution satellite images. A comparison of declassified Corona (1974) vs. GeoEye-1 (2014) image. Image credits: EarthExplorer (Corona) and Google Earth (GeoEye-1). In the current era, most high resolution satellite images are commercially available, and are being used as a substitute to aerial photographs. The launch of SPOT, IKONOS, QuickBird, OrbView, GeoEye, WorldView, KOMPSAT etc. offer data at fine resolutions in digital format to produce maps in much simpler, cost effective and efficient manner in terms of mathematical modeling. A number of meaningful products are being derived from high resolution datasets, e.g., extraction of high resolution Digital Elevation Models (DEMs) with 3D building models, detailed change assessments of land cover and land use, habitat suitability, biophysical parameters of trees, detailed assessments of pre and post-disaster conditions, among others. Both aerial photographs and high resolution images are subject to weather conditions but satellites offer the advantage of repeatedly capturing same areas on a reliable basis by considering the user demand without being restricted by considering borders and logistics, as compared to aerial survey. Pansharpening / resolution merge provides improved visualization and is also used for detecting certain features in a better manner. Pansharpening / resolution merge is a fusion process of co-georegistered panchromatic (high resolution) and multispectral (comparatively lower resolution) satellite data to produce high-resolution color multispectral image. In high resolution satellite data, the spectral resolution is being increased and more such sensors with enhanced spectral sensitivity are being planned in the future. Conflicts of Interest: The findings reported stand as scientific study and observations of the author and do not necessarily reflect as the views of author’s organizations. About this post: This is a guest post by Hammad Gilani. Learn more about this blog’s authors here. This entry was posted in Uncategorized and tagged Optical High Resolution Satellite Images, Remote Sensing Sensors on January 10, 2015 by Hammad Gilani. Night Lights of the World. Image credits: NASA and NASA Earth Observatory. With the advent of very high resolution satellites in the last decade or so, the conventional ideas in remote sensing are undergoing a rapid change. High-resolution imaging satellites working in the optical and NIR bands are increasingly being operated even in night-time, not to study the thermal emitted IR, but the artificial light sources by humans. In the past decades, the US Defense Meteorological Satellite Program (DMSP) satellites have been used for night-time imaging of man-made objects and features, albeit at a low resolution. Imagesat International offers high-resolution night-time imagery through its EROS-B satellite. 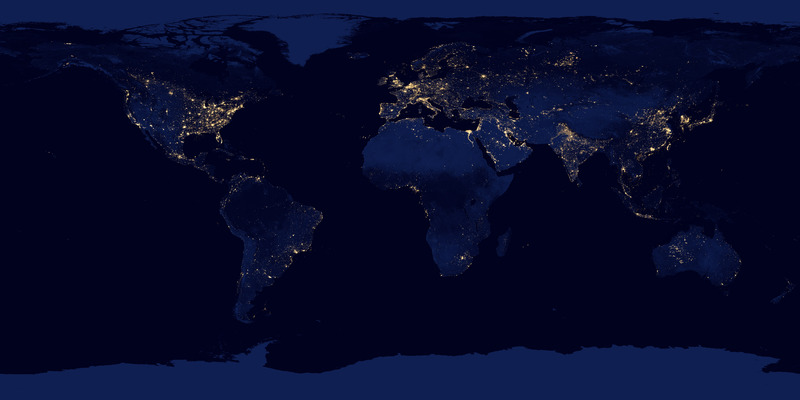 NASA provides a nice world map of night lights, which shows hubs of activity at night on the Earth. Chris Elvidge of NOAA is a well-known name in the study of night-time Earth, and here is a great feature article on years of research done by him. 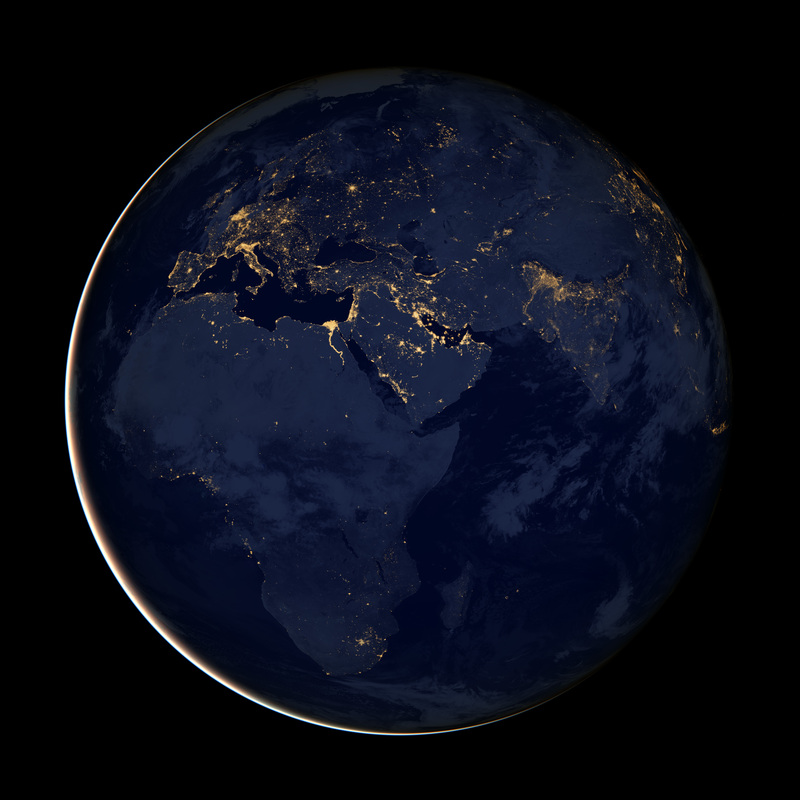 For some more awe-inspiring night-time images, see NASA’s Earth Observatory Night Lights feature page. Skybox Imaging is now delivering high-resolution images and video, both at day and night-time. Take a look here. Night Lights of Asia and Africa. Image credits: NASA and NASA Earth Observatory. This entry was posted in Uncategorized on January 3, 2015 by WQ.